2/11/14 ** Eat Like a Bear traces the food-hunting journey of a brown bear through the seasons. 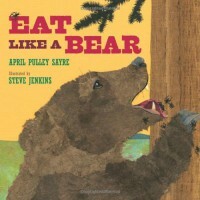 The book text perfectly captures the rhythm of the seasons and the bear's quest for food. Sayre's language is poetic without feeling forced. The phrase "paw and claw and pull" recurs with slight variations, adding to the predictability of the text. Also, each new season is introduced with a question, drawing a young reader or listener into the story. I thoroughly enjoyed the non-fiction material coupled with a character in the form of a wild bear. An added advantage is that I learned of plants I'd never heard of. The last two pages include additional information about bears and conservation. 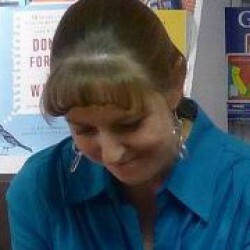 How I encountered this book: Sayre posted a FB comment that she was grateful to have her book included on the ALA/Youth Media Notable Books list. Because she is an Indiana author, I requested Eat Like a Bear from the library.